Imagine my surprise when I was out thrifting and stumbled upon this darling little guy. Price tag? $4. 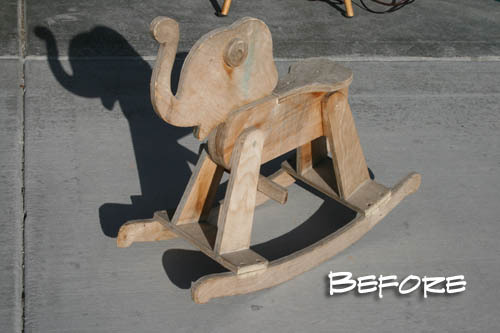 Took him home , sanded the rough edges and gave him a couple coats of lime green paint. Figured lime green was gender neutral for possible baby boys in my future. For right now, my little girl loves him! Love this little elephant rocker...never seen anything like it. Wow that is so cute and unique! 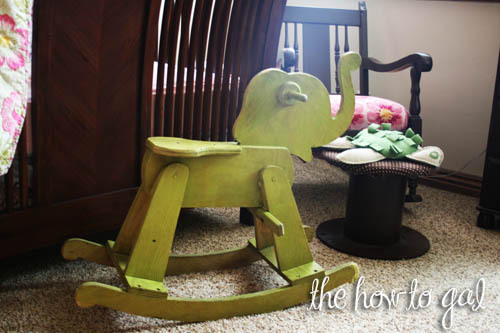 I love the elephant and the lime green :) Isn't paint miraculous?